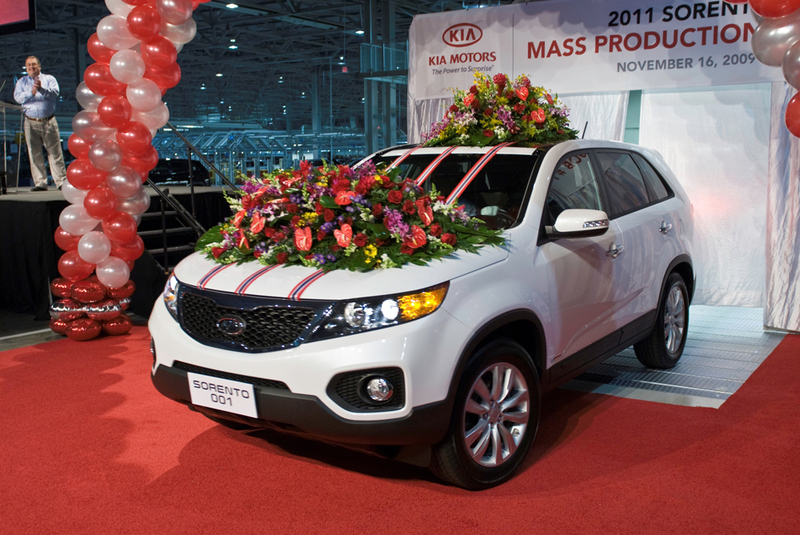 WEST POINT, GA - November 16, 2009: The first U.S. built Kia vehicle, a white 2011 MY Sorento CUV, rolled off the production line today at Kia Motors Manufacturing Georgia (KMMG), officially opening the first U.S. Kia Motors(2) plant. KMMG is expected to produce 300,000 vehicles at full capacity and employ 2,500 people, with on-site and nearby suppliers creating 7,500 additional jobs in the region. "The start of production for our first manufacturing facility in the United States further demonstrates our commitment to growth in North America and we are proud to be adding 2,500 jobs to the local economy," said B.M. Ahn, group president and CEO, Kia Motors America (KMA) and KMMG. Representing an investment by Kia Motors of $1 billion, KMMG will establish new benchmarks for vehicle quality and productivity by utilizing some of the world's most advanced manufacturing techniques. KMMG's general assembly area is outfitted with more than a half mile of height-adjustable conveyors to achieve the most favorable installation position for each team member and reduce physical fatigue. Also in general assembly, KMMG is the only plant in North America outfitted with wood flooring, which provides a more comfortable and forgiving work environment for team members. Built on 2,200 acres, the complex includes a body stamping facility, a transmission shop where the all-new 2011 Sorento's six-speed automatic transmission is produced, and a two mile test track in addition to the main assembly plant. The plant's 186-foot-long stamping press delivers 5,400 tons of pressure to stamp steel into 17 different types of vehicle panels for the all-new Sorento, operating at a speed of seven to 15 strokes per minute. The massive stamping equipment spans from almost 20 feet below the floor to 39.4 feet high. KMMG continues Kia Motors' aggressive investment in the U.S. market. Since 2002, more than $1.3 billion has been invested in various facilities throughout the country, including a dedicated corporate campus and design center in Irvine, Calif., a state-of-the-art research and development center in Ann Arbor, Mich. and custom-built vehicle proving grounds in Mojave, Calif. Since coming to market in the United States, Kia Motors, through its US-based marketing and distribution arm, KMA, has expanded to a full product line of vehicles and enjoyed 14 years of consecutive market share increases, including a 50 percent increase through October 2009. Most recently, KMA posted its best sales quarter in company history and is one of only three automakers whose sales are up over their 2008 sales pace. (1)KMMG vehicles are built with U.S. and globally sourced parts. (2) Kia Motors includes Kia Motors Corporation (KMC) and its affiliates, Kia Motors America, Inc. (KMA) and Kia Motors Manufacturing Georgia, Inc. (KMMG).